I like it when I hear about the wine enthusiasts about town making New Year resolutions that center around tasting and sampling wines that either they haven’t had in a while or have never tried. So let’s help the cause and think through some enlightening vino for the up-coming seasons. Eiswine (Icewine) is definitely something to consider in January because the wine cannot be produced until the weather outside is frightening; I’m thinking the powerful winter artic outbreak that crashed into the East Coast this week was the ticket in Canada and in the Finger Lakes region of New York—but no one was thinking Icewine in that mess. 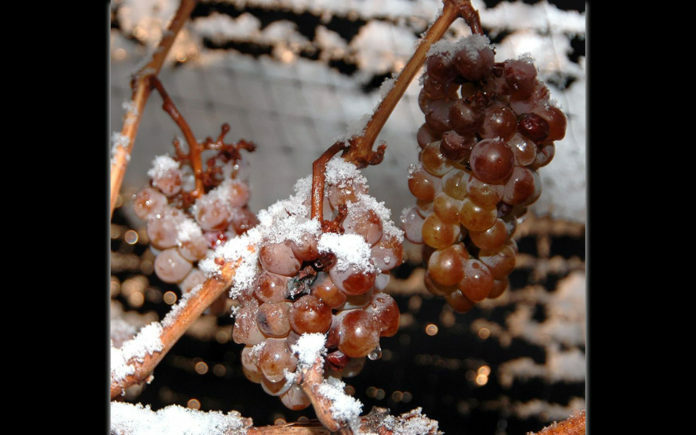 Icewine is a pricey product because a producer wanting to produce it must set aside some vineyard space around October so the grapes hang on the vine until such time as the serious frost required arrives as soon as the temperature drops sufficiently and the grapes freeze, grapes need to be picked before dawn, and pressed into grape must. Because much of the water in the grapes is frozen, the pressed juice is concentrated, rich in flavor and high in sugar and acidity. Indeed, ice wines are extraordinarily sweet but yet balanced by laser-focused acidity exhibiting bright fruit essences. Germany and Canada—having early and cold winters in common, probably produce the best ice wines in the world and are the leading producers of traditional ice wines, but Austria, Switzerland and the United States, particularly Michigan and the Finger Lakes can produce some tasty stuff. Ice wine usually has a medium to full body, with a long lingering finish. The nose and palate is usually reminiscent of peach, pear, dried apricot, honey, citrus, figs, caramel, green apple. Further aromas of tropical and exotic fruits such as pineapple, mango, or lychee are also quite common. They make an excellent aperitif and these sweet nectars are a perfect complement to nut & fruit-based desserts and ice-cream or sorbets. And, they are stunningly impressive enough on their own to be dessert. Even those enthusiasts who do not even think about enjoying a “sweet wine”, once they’ve finally relented and taste the wine, they realize the bracing acidity keeps the experience fresh, alive, and exciting. Relatively low in alcohol—often with only seven percent or so, it’s the perfect dinner party quaff—before, during, or after the meal. It’s typically consumed in a two-ounce pour, or half the typical wine pour. Inniskillin Gold Oak Aged Vidal Icewine 2008, $50, is a great tasty example of Canadian Ontario Icewine. The Jackson-Triggs Proprietors’ Reserve Vidal Icewine, at $20 or so, is definitely an entry-level wine for starters. Speaking of sweet wines, we have two of the most popular world class dessert wines, Tokaji Aszú [tohk-EYE-ee ah-SOO] from Hungary and of course Vintage Port wine from Portugal, doing a reversal of sorts, where those classic regions are now producing “dry” wines from the same grape varietries. Portugal has been producing stellar dry reds for a long while and they’re becoming more popular. I’ve just sampled through an exciting lineup and look forward to discuss them in an upcoming column. Furmint ranges in color from pale straw to light amber, with aromas of pineapple, lemon blossom, orange rind, ripe pear, white peach, yellow peach and apricot. Dry Furmint frolics lovely with seafood, shellfish, raw oysters, sushi, spicy foods, chicken and most vegetables. The lemon-roasted chicken and broccolini was an excellent match. The Barta 2013 Öreg Király Dűlő Mád Furmint; $30, is probably harder to find but worth the effort Aromas of Turkish delight, marzipan and lemon blossom lead the way to rich, ripe flavors of green apple, dried pineapple and lemon zest. This well-made wine has a strong mineral backbone with a brisk, clean finish. 2014 Robert Mondavi Reserve Chardonnay, Carneros, Napa Valley, $50. This is, of course, a treat when you have the bucks for a classic Carneros Mondavi chard. Lush ripe pear and smooth new oak in a cool-climate setting. 2013 Seghesio Family Vineyard Barbera, Alexander Valley, $38. This is fruit from a century old vineyard that has always produced some of the best California Barbera in the state. The nose is very aromatic revealing scents of cherry, vanilla, notes of oak and dark berries. A medium bodied wine that has a smooth texture, good balance and soft tannins. The palate reveals flavors of blackberry, blueberry, cherry and a spicy finish.